This place has a strange topography. It is a hill surrounded by flatness. Freshly paved roads stretch across the crest of the hill leading to the usual big box stores, a Home Depot, a Target, a TJ Maxx, (etc). Hills don’t appear without reason and this particular hill is distinctly man-made, or, more specifically it is Ford made. In the 1950’s clay was dug from the earth and transformed into brick and cement, and subsequently into structures that sheltered the booming business of Ford. During the mining it was observed that the pit had a geology that made it particularly well suited for use as a stable landfill. After excavating the site, the pit was filled with “non-putrescrible” waste (not liable to decay) from the sprawling Ford River Rouge Center. After being covered, it sat, unused for decades. Now layers of membranes, geofoams, complex plumbing and gas venting co-mingle with clay and waste and define the recent geology of this place. Even the small pond at the foot of the “hill” has a HDPE liner. The development is officially named “Fairlane Green“, but locals to Dearborn and Allen Park casually refer to it as “the Hill”, and according to some Detroiters it is commonly called “The Heap”. Waste from the Ford Piver Rouge Center was buried in the void of the clay mine. The crest of the hill is bald with pavement, but beyond the ample parking and retail, wildflowers show off their colors, indifferent to the fact that the audience to their beauty rushes past and scarcely notices. This place is a collage of intentionally arranged materials, illustrating extreme shifts in the way our society manages land. It is a stratified poem exploring an evolving push and pull in a complex and deeply imperfect relationship. The reuse of this land after it was declared a brownfield is portrayed as victorious redemption in the name of “usefulness”. But what I find most redeeming about this place is the periphery, alive with flowers, and insects, and waterfowl in a secret wild land. Ikebana, The Japanese art of flower arranging is often distinguished from other forms of floral arrangement because of its focus on bringing nature and humanity together. It has been known for fostering an appreciation for typically overlooked beauty in nature; the lines of stems, the patterns in foliage, the textures of dying and insect eaten leaves which allude to the passage of time. The intense focus Ikebana requires, lulls me into speechlessness. This, is not by accident. Many Ikebana artists practice in complete silence, so that they can devote their attention to their surroundings and the form of their arrangement. The periphery of Fairlane Green is particularly well suited for the practice of Ikebana. It is regarded as a sort of “non-place” that is usually not experienced other than in a fleeting glance out of a car window. It is a vital and beautiful field, next to an archetypal monument to suburban banality. And so, the form of the picnic came into focus; we would quietly pick and arrange flowers on the hill. I had originally planned to ask that we be silent for 30 minutes… but before the picnic I got quite nervous about this. As the facilitator, I always struggle with how strongly to shape the experience and how much guidance to give. The idea of asking people not to speak seemed so severe… perhaps even joyless. As I self-consciously described my intent for the picnic, all of the present attendees seemed eager to accept the constraint. So we departed on a walk, meandering through the wooded area at the foot of the hill and up onto the surface of the landfill to gather flowers together, in silence. In the silence I became more aware of the sound of my galoshes as they flapped against my bare shins, I even curled my toes tightly in an attempt to quiet the noise. The percussion of brittle stalks brushing against my legs, the clicking of insects, the low hum of the highway, and announcements from the nearby Lowes rose up out of the landscape. Without ongoing conversations we spread out more. I had only planned one stretch of silence, but Emily, Alissa, Caitlin, Clark and Sara all wanted to continue on with it, so we did. After gathering flowers and plants we returned to our picnic spot and began arranging our flowers and enjoying the shared picnic. We spoke quietly and some of us stayed silent. Usually after a Picnic Club rendezvous my brain spasms to make sense of all of it… to place all of my observations and judgments and look for an emerging narrative. Like making a collaborative abstract artwork, I step back after each sweeping gesture made by the group to know what we are making and to know how to shape it. At the Quiet in the Flowers picnic, I felt like I was able to engage in the sensory experience of it more, rather than fretting about the experience I was fostering. This is very important to me. I left feeling extraordinarily calm, and having stupidly simple and positive feelings about the experience. It is my hope that Picnic Club will increasingly become a gathering place and point of departure that delivers us from the mundane. 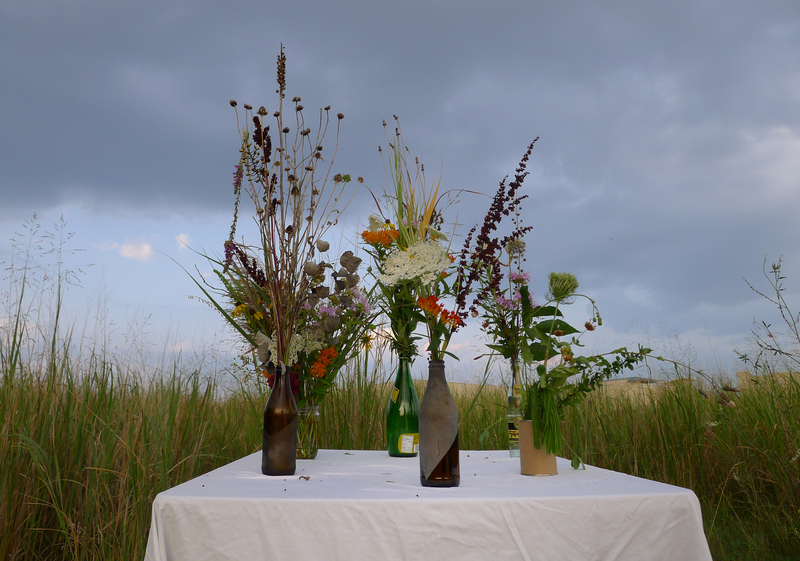 During the Quiet in the Flowers Picnic, Emily Gustafson recorded found sounds for a project that will be displayed in conjunction with Abigail Anne Newbold’s solo exhibition titled, Living Through Making: Borderlander’s Outfitter. Emily may even be gracing this blog with some of her sounds and words in the future, so stay tuned. Michael Collino also scoured the airwaves with a shortwave radio in search for source material. I hope that picnic club continues to be a place where things are gathered. I am grateful for the connections to new friends and places that Picnic Club has helped me to make. Thank you for watching the sunset in the field behind the Guitar Center with me! Thanks to everyone who attended: Emily Gustafson, Alissa Lamarre, Sara Milner, Stephan Vincent, Dan Clark, Caitlin Drinkard, Timothy Boscarino, Jacqui Au, Charley Mancuse, and Michael Collino.